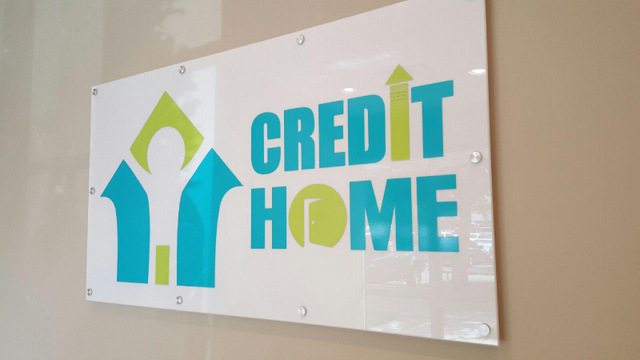 New Business Signage and Graphics for Credit Home in Orlando! When you are opening the doors to a business for the first time, there are a lot of considerations to keep in mind. Not least among them is your signage. It is generally a good idea to choose one sign company for all of your new signs and graphics. 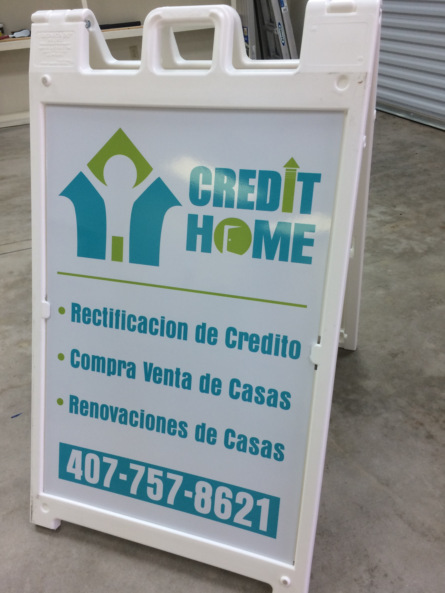 Thankfully, Credit Home realized this, so they contacted the friendly experts at Citrus Sign Studio for new business signage and graphics for financial businesses in Orlando. 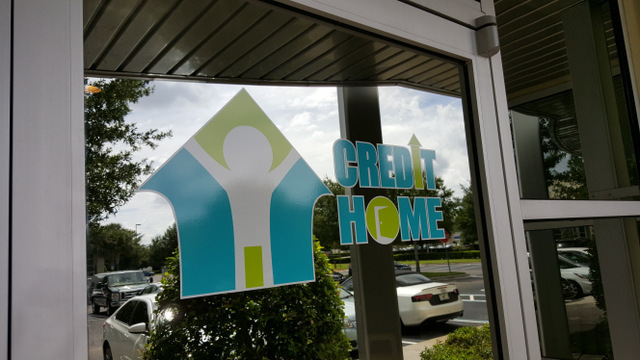 Credit Home is one of the newest businesses in Orlando. They are so new, they don’t even have a website yet! The mission of Credit Home is to serve the area’s Spanish speaking population by helping them to become homeowners or to renovate their existing property. They offer a number of credit services, including aiding clients in repairing their credit, buying homes, and remodeling homes. When an organization that provides such a valuable service to local Hispanic residents contacted us for signage makeovers for financial companies in Orlando, we were more than happy to help! Credit Home was opening up a brand new office and needed signage for everything. Fortunately, as a full service sign shop, there is nothing we can’t do. Lobby Sign – We started with a 60” by 33” acrylic panel. We then applied vinyl graphics featuring the Credit Home logo to the panel. The panel was then installed with standoffs to create a dimensional effect. 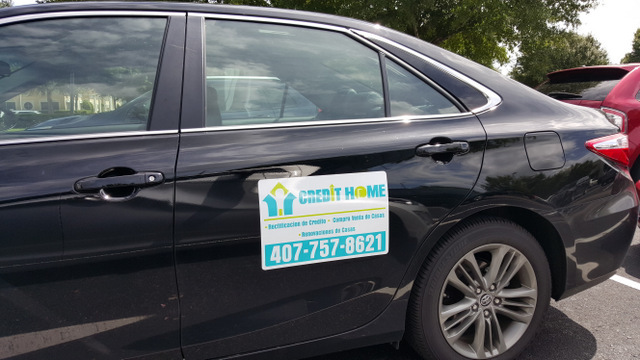 Car Magnets – Next, Credit Home wanted to use their vehicles to attract clients while on the road. This is easy to do with car magnets. We made the company name, logo, and phone number the primary focus of the magnets. We then listed some services in Spanish to reach their target demographic. A-Frame Sign – They are located in a strip mall that gets a fair amount of foot traffic. The best way to get the attention of consumers in these retail areas is with a sidewalk sign. Now, as potential customers walk by the storefront, they will be unable to avoid Credit Home’s message. Door Graphics – Again, we used digitally-printed vinyl adhesive to render their logo. We also used inexpensive cut vinyl lettering to display their office hours on their door. In the end, Credit Home was completely satisfied with the job we did. Are you planning on opening a new brick-and-mortar business in the coming weeks or months? Do you have your signage yet? If not, what are you waiting for? The second the ink dries on your lease, you can contact us for new markers. From coming soon banners to wall murals that set the tone for your interior décor, we do it all. If you are interested in learning more about what we can do for your venue, contact Citrus Sign Studio today for a free consultation.